Choose the paint that's right for your needs. "Provides a wide range of colors and painting options with which to experiment." "The paint's consistency is quite 'sticky' and buttery, great for using with a knife." "Mixing is easy because of the soft consistency of the paint." 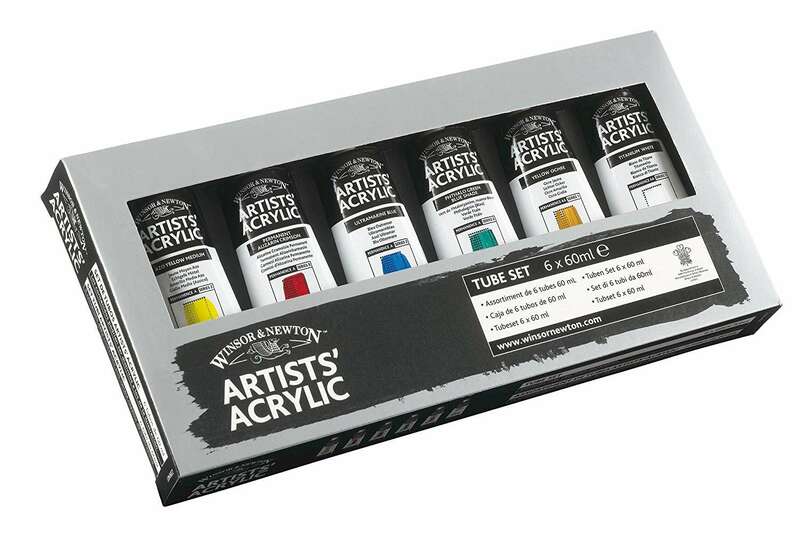 "Top-quality acrylic paints for artists in a range of vibrant colors." "An extended drying time makes them most comparable to oil paints amongst all acrylic paints." "Colors are sumptuous, strong and saturated, and blend together beautifully." "Don't form a skin as they dry so you can rehydrate to keep working wet-in-wet." "Useful if you have a large area to cover, especially in an underpainting." "Soft consistency that will hold brushmarks if used undiluted, straight from the tube." "Thickly buttery but spreads easily when diluted." "Good strength in colors and works easily." W&N launched this range of acrylics in January 2009 to replace their Finity series. It is indeed a different product, having a longer working time (up to half an hour), a minimal shift from wet to dry (because of a new binder), and a satin finish (rather than gloss). The tube labels have a painted color swatch rather than a printed one. Ten Finity colors have been discontinued and 17 new colors introduced. The colors are rich, intense, and saturated, with a soft butter consistency that holds brushmarks. This brand is a nice option for beginners because it provides a wide range of colors and painting options to experiment with. Liquitex's Heavy Body Professional Artist Colors is a well-known favorite. The paint's consistency is quite buttery and 'sticky' (so great for using with a knife) and the paints come in plastic tubes which are incredibly robust. (To be technically accurate, Liquitex comes in Glaminate, tubes made from laminated layers of plastic, metal, and paper.) There's also a Soft Body option, which is useful if you paint mostly with glazes or fluid paint. Sennelier makes fast-drying acrylics with a consistency that's on the soft side of buttery. The colors are strong and saturated, and mixing is easy because of the soft consistency of the paint. The paint spreads smoothly and easily on a canvas. If you like glazing and blending more than textures, Sennelier is an excellent choice. Golden is an American company created specifically to produce top-quality acrylic paints for artists. They provide a range of vibrant colors, including an extremely useful set of neutral grays. The paint consistency is like smooth, soft butter which can be thinned down for glazes easily, and dries rapidly. For serious impasto (thick layers of paint), you'll most likely want to add some medium (Golden produces a range of options, including gels and molding pastes). Golden also produce fluid acrylics, an ultra-fluid acrylic called 'High Flow,' a heavy body matte acrylic, and a slow-drying acrylic called Open. Launched in mid-2008, Golden's Open Acrylics have an extended drying time, making them the most comparable to oil paints amongst all acrylic paints. Open Acrylics stay workable on a normal palette for hours rather than minutes, eliminating the need for a moisture-retaining palette. Open Acrylics provide the ease of using water as a medium (and for cleaning brushes) with a long working and blending time. The color range isn't as extensive as for Golden's Heavy Duty acrylics, but the fundamentals are included. M. Graham & Co.'s paints have a high pigment loading, so the colors are intense. The colors are sumptuous, very strong and saturated, and blend together beautifully. If you were used to working in oils and wanted to swap to acrylics, this would be a brand to try for the rich colors and slightly thicker consistency. The special feature of these acrylic paints is that, according to the manufacturer, they don't form a skin as they dry so you can rehydrate them to keep working wet-in-wet by spraying some water on the paint or using a wet brush. This means it is possible to work back into the paint with a wet brush, which makes blending colors less of an urgency and easier. If you do a lot of blending of colors rather than glazing, consider this brand of acrylic. Matisse structure paint is a typical acrylic paint that does what you'd expect from a decent artist's quality acrylic. Probably the only unexpected thing about it is that it's made in Australia and has some unique color names (such as Southern Ocean Blue or Australia Sky Blue). It has a soft consistency that will hold brushmarks if used undiluted, straight from the tube. It can be diluted with water and/or medium for painting without leaving brushmarks, for glazing, or for watercolor-type techniques. To increase the impasto (thick paint) effect, you'd mix it with impasto or texture medium. This is an American brand of paint which seems to be distributed only in the U.S. The paint is thickly buttery but spreads easily when diluted. The colors are what you'd expect from an artist's grade paint: saturated, with good tinting or covering strength depending on what color it is. If it's one of the options at your local store, it's worth considering. Winsor & Newton's Galeria brand is an affordable or student's grade of paint that has good strength in colors and works easily (though you'll have to add texture paste if you want thick paint as it's quite soft). And it doesn't put too huge a dent in your pocket. 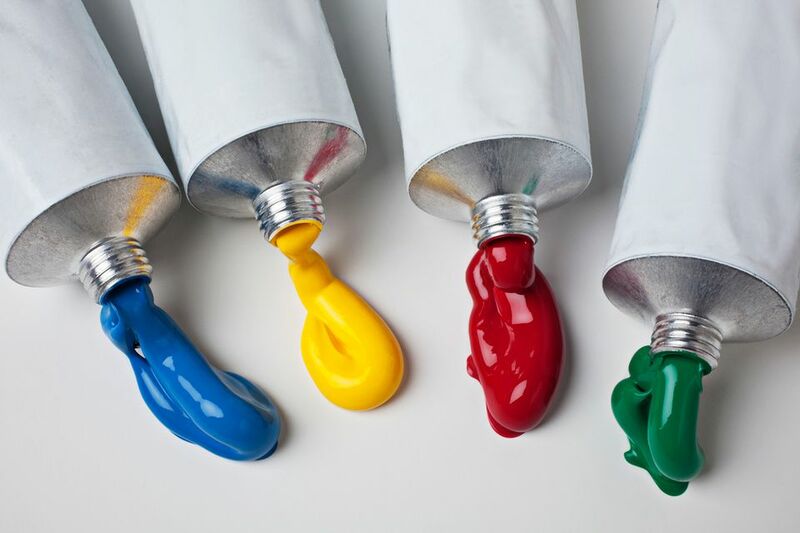 There are a number of other brands of acrylic paint on the market, such as TriArt (Canadian), Lascaux, Grumbacher, Schmincke, Brera (Maimeri), and Daniel Smith. Check on the tube to see what pigments the paint is made from, whether it's been graded as lightfast, and buy a tube in a color you use regularly to see how it compares to what you usually use.